How Does VelocityShares’ ZIV Work? Just about anyone who’s looked at a multi-year chart for a long volatility fund like Barclays’ VXX has thought about taking the short side side of that trade. VelocityShares’ ZIV is an Exchange Traded Product (ETP) that allows you to hold a short volatility position while avoiding some of the issues associated with a direct short position in VXX. Because ZIV is tied to VIX futures with at least 4 months until expiration its daily percentage moves are considerably smaller than the moves of funds (e.g., VXX, UVXY, TVIX) that are tied to shorter term, more volatile VIX futures. To have a good understanding of how ZIV works (full name: VelocityShares Daily Inverse VIX Medium-Term ETN) you need to know how it trades, how its value is established, its characteristics, its risks, and how VelocityShares (and the issuer— Credit Suisse) make money running it. ZIV trades like a stock. It can be bought, sold, or sold short anytime the market is open, including pre-market and after-market time periods. With an average daily volume of 120 thousand shares, ZIV’s liquidity is good. Its bid/ask spread tends to run around 10 cents, which is on the high side, but as a percentage of its trading value that’s ~0.15% so it’s not a big economic penalty. Unfortunately, ZIV does not have options available for it. However, both of its closest Exchange Traded Fund (ETF) equivalents, REX ETF’s VMIN and ProShares’ SVXY -0.5X short term ETF do have options available. Like a stock, ZIV’s shares can be split or reverse split—but unlike VXX (with 5 reverse splits since inception) ZIV has only split once, a 1:8 split in June 2011 that took its price from $129 down to $16. Unlike Barclays VXX, ZIV is not on a hell-ride to zero. ZIV can be traded in most IRAs / Roth IRAs, although your broker will likely require you to electronically sign a waiver that documents the various risks with this security. Shorting of any security is not allowed in an IRA. How is ZIV’s value established? Unlike stocks, owning ZIV does not give you a share of a corporation. There are no sales, no quarterly reports, no profit/loss, no PE ratio, and no prospect of ever getting dividends. Forget about doing fundamental style analysis on ZIV. 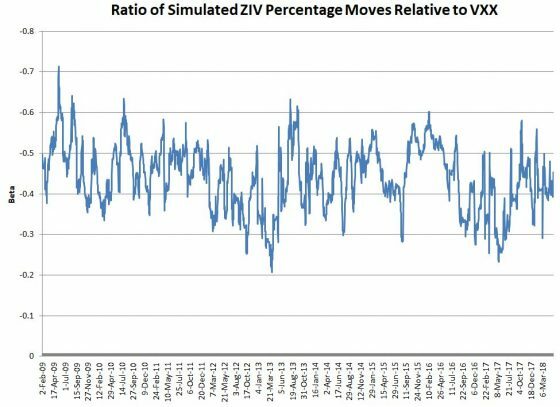 While you’re at it forget about technical style analysis too, the major price moves of ZIV are not driven by supply and demand for ZIV itself but rather by the moves of the large, liquid VIX futures market. Ultimately ZIV value is tied to the daily resetting inverse of an index (S&P VIX Medium-Term Futurestm) that specifies a hypothetical portfolio of VIX futures with 4 through 7 months until expiration. Every day the index specifies a new mix of VIX futures in that portfolio. On any given day one-third of ZIV’s assets are allocated to VIX futures with 5 months till expiration, another third is allocated to 6th-month futures, and the final third is split between 4th and 7th-month futures. This mix of VIX futures gives ZIV the approximate performance of a VIX future with 153 days until expiration. The index ZIV tracks, SPVXMP, is maintained by the S&P Dow Jones Indices. The theoretical value of ZIV, if it were perfectly tracking the inverse of the index, is published every 15 seconds during market hours as the “intraday indicative” (IV) value. Yahoo Finance publishes this quote using the ^ZIV-IV ticker. Because ZIV’s day end value is set by the settlement prices of VIX futures the closing IV value of ZIV is established around 4:15 PM ET not at the 4 PM NYSE close. Wholesalers called “Authorized Participants” (APs) will at times intervene in the market if the trading value of ZIV diverges too much from its IV value. If ZIV is trading sufficiently below the index they start buying large blocks of ZIV—which tends to drive the price up, and if it’s trading above they will short ZIV. The APs have an agreement with Credit Suisse that allows them to do these restorative maneuvers at a profit, so they are highly motivated to keep ZIV’s tracking in good shape. According to ETF.com ZIV’s median tracking error relative to its index is -0.04%. Almost all the time the medium-term VIX futures that underlie ZIV are in a configuration called contango where the longer dated futures are more expensive than the ones closer to expiration. Persistent contango sets up an attractive short trade because as long as contango persists the VIX futures shorted by ZIV will tend to go down in value over time. Contango does not guarantee profits for the short seller because if volatility spikes the medium-term futures tend to go up in unison but historically around 75% of the time ZIV is increasing in value. This situation sounds like a short sellers dream, but VIX futures occasionally go on a tear, turning the short volatility trader’s profits into losses very quickly. While not as volatile as the short-term volatility funds ZIV can drop dramatically. Its record one day drop so far was -26% on February 5th, 2018 and one day drawdowns of over 10% are fairly common. 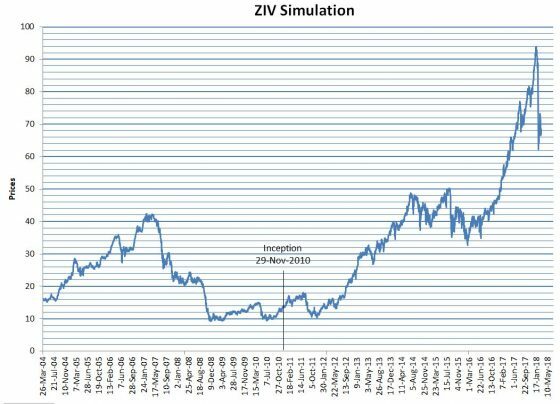 The chart below shows ZIV from 2004 using simulated values. There are some very good reasons for this rebalancing, for example, a true short can only produce at most a 100% gain and the leverage of a true short is rarely -1X (for more on this see “Ten Questions About Short Selling”. 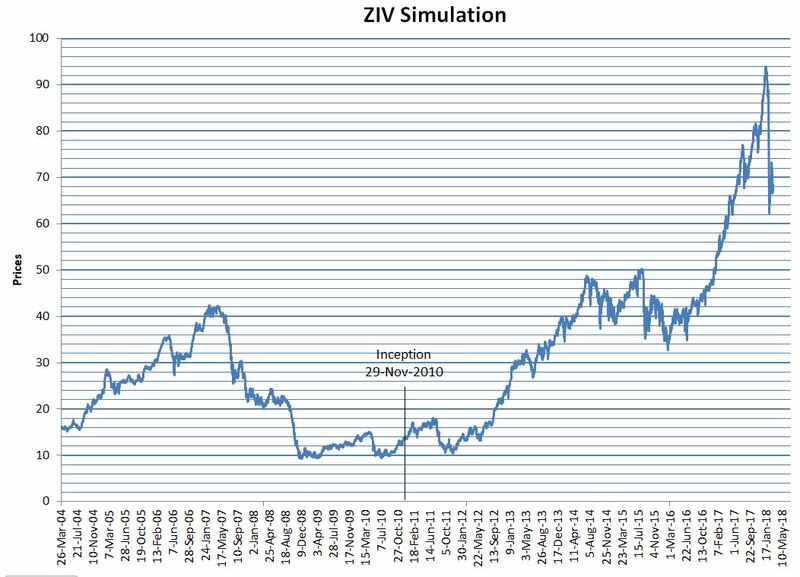 ZIV, on the other hand, is up almost 500% since its inception on November 29th, 2010, and it faithfully delivers a daily percentage move very close to -1X of its index. Historically ZIV has median moves of -0.21X compared to the CBOE’s VIX index. If the VIX moves up 10% you can expect ZIV on average to move down 2.1%. However, this relationship is not cast in stone. At times ZIV and VIX will even move in the same direction. Another important statistical ZIV relationship is its typical moves relative to the short-term volatility index which big volatility funds like VXX, UVXY, and TVIX are tied to. 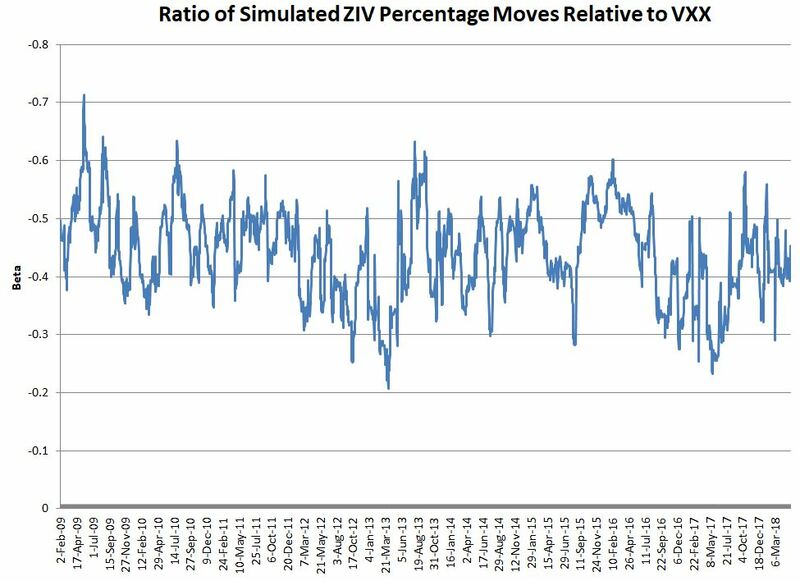 Its median beta, the ratio of ZIV percentage moves to VXX moves, is around -0.44. This ratio varies but as the chart below shows the variation since VXX started trading in January 2009 has remained between -0.2X and -0.72X. Along with their impressive upsides, inverse volatility funds like ZIV carry considerable risks. The risks include the inevitability of volatility spiking up during market scares, corrections, or bear markets. Since its inception in 2010, ZIV has experienced 30 single day drawdowns of -5% or more, including the previously mentioned -24% crash. As scary as this is the other inverse volatility funds -0.5X SVXY and VMIN carry even more drawdown risk with worse case one-day drawdowns of -48% and -38% respectively. Buying and holding these securities is not for the faint of heart. Another risk is termination. ZIV’s prospectus states that if ZIV drops 80% or more in a single day it will likely terminate. Before February 2018 there was a lively debate on whether this was a credible risk even for the higher leveraged former -1X short term inverse funds XIV and SVXY—which were much more likely to terminate than ZIV. On February 5th, 2018 both XIV and SVXY dropped more than 90%. XIV was subsequently terminated by Credit Suisse and SVXY was deleveraged by ProShares down to -0.5X. Based on that day’s behavior it would take a one-day VIX spike of over 300% to put ZIV in risk of termination (the 5-Feb-2018 VIX spike was 115%). If VIX futures became even more reactive than they were on the 5th it might require a lower VIX jump than that but the bottom line is that it would likely take an event equivalent or bigger than the October 1987 crash to terminate ZIV. How do VelocityShares and Credit Suisse make money on ZIV? Credit Suisse collects a daily investor fee on ZIV’s assets—on an annualized basis it’s 1.35%. With current assets at $120 million, this fee brings in around $1.6 million per year. That should be enough to cover Credit Suisse’ ZIV costs and be profitable. My understanding is that a portion of this fee is passed onto to VelocityShares for their technical and marketing activities. Unlike an Exchange Traded Fund (ETF), ZIV’s Exchange Traded Note structure does not require Credit Suisse to report what they are doing with the cash it receives for creating shares. The note is carried as senior debt on Credit Suisse’s balance sheet but they don’t pay interest on this debt. Instead, they promise to redeem shares that the APs return to them based on ZIV’s daily closing indicative value. Credit Suisse could hedge their liabilities by shorting VIX futures in the appropriate amounts, but they almost certainly don’t because there are cheaper ways (e.g., over-the-counter swaps) to accomplish that hedge. With XIV delisted and SVXY deleveraged ZIV has a comparable leverage factor with the remaining inverse volatility funds (VMIN, and -0.5X SVXY). Historically it has declined less than its competitors on the really high volatility days (5-Feb-2018 and Brexit shocks). ZIV can’t guarantee that advantage in the future but it is comforting to see a track record of smaller drawdowns during historic VIX spikes. In the post-February 2018 volatility landscape, ZIV is an attractive choice for shorting volatility.